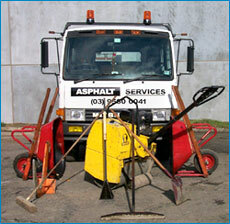 At Asphalt Services we specialise in all forms of asphalt construction, asphalt repairs and maintenance. To enhance your project we also install associated edging of your request including brick paver, timber, bluestone, concrete (coloured or plain). 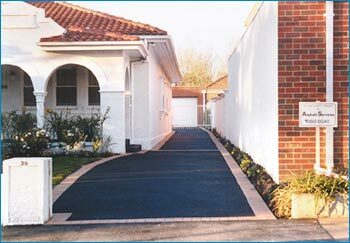 We use only the best materials and we do the job properly the first time at a high quality of workmanship. Unlike many of our competitors, we don't take short-cuts! We want our work to stand the test of time. We know your property is important to you, whether it's your home or business premises. We are able to offer you a variety of options depending on the amount and type of traffic you expect on your footpath, driveway, car park, or school yard. We pride ourselves on our ability to provide the service and produce high quality work. Wherever you are in and around greater metropolitan Melbourne, we can provide you with our outstanding service. We will always be in constant communication with you through out our pre-sales process and the job itself. Have Mobile Telephone can, at all times, communicate with you." As a reputable company, our employees live up to our demands for high quality work. We apply a stringent Quality Management System which incorporates Occupational Health & Safety within Our Quality Manual, Operational Manuals and Quality Procedures. All of our Quality Management Documentation can be viewed on demand and we encourage development through Second Party (Customer) Audits. Our work crews, through Training and Development via the Quality Management System, are professionals and take a pride in their work. No job is too large or too small - or too difficult. Our superior construction techniques enable us to complete all of our jobs on time, on budget, and to specification. From the time you first make contact with us you will be impressed by our professional and personable staff. We are also able to offer you bobcat, tipper and excavator hire, so talk to us about our minor landscaping and excavation services.